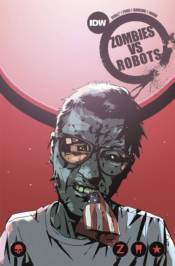 In this second collection of the ongoing Zombies vs Robots, co-creator Chris Ryall is joined by artists Paul Davidson (Judge Dredd) and Antonio Fuso (Drive) in this latest ZvR collection in stories that expand the battle from the Earth to the moon and back. Also featuring Ryall and Ashley Wood's 'Tales of ZvR' strips, a bonus story by Lucy Ryall and Nico Pe�a, a prose story by Nancy Collins, and a complete cover gallery. Collects issues #7-10.